Air Force Staff Sgt. Phillip Myers' casket is lowered to the tarmac on Sunday, April 5, 2009 in Dover Air Force Base, Del. After receiving permission from the family, Myers is the first casualty to be observed arriving at Dover since the ban on media news coverage of returning war dead was put in place 18 years ago. DOVER AIR FORCE BASE, Del. – Media witnessed a Sunday night ceremony for the arrival of a Virginia airman killed in Afghanistan, marking the end of an 18-year ban on news coverage of returning U.S. war dead. After receiving permission from family members, the military opened Dover Air Force Base in Delaware to the press. An eight-member team wearing white gloves and camouflage fatigues carried the body of 30-year-old Air Force Staff Sgt. Phillip Myers of Hopewell, Va., off a jet in a solemn ceremony on a cool, clear night. Myers was killed April 4 near Helmand province, Afghanistan, when he was hit with an improvised explosive device, the Department of Defense said. The ceremony under the yellowish haze of airport floodlights took about 20 minutes with Myers' wife and other family members in attendance. Myers was a member of the 48th Civil Engineer Squadron with the Royal Air Force in Lakenheath, England, one of the bases the U.S. Air Force uses in the country. He was awarded a Bronze Star for bravery last year in recognition of his efforts in support of Operation Enduring Freedom, the Department of Defense said. The new Pentagon policy gives families a choice of whether to admit the press to ceremonies at Dover, home to the nation's largest military mortuary and the entry point to the U.S. for service personnel killed overseas. Critics of the previous policy had said the government was trying to hide the human cost of war. President Barack Obama had asked for a review of the ban, and Defense Secretary Robert Gates has said that the blanket restriction made him uncomfortable. The administration will let families decide whether to allow photographs. For example, if several caskets arrive on the same flight, news coverage will be allowed only for those whose families have given permission. The ban was put in place by President George H.W. Bush in 1991, at the time of the Persian Gulf War. From the start, it was cast as a way to shield grieving families. There have been several exceptions since then, most notably in 1996 when President Bill Clinton attended the arrival of the remains of Commerce Secretary Ron Brown and 32 others killed in a plane crash in Croatia. In 2000, the Pentagon distributed photographs of the arrival of remains of those killed in the bombing of the USS Cole and in 2001, the Air Force distributed a photograph of the remains of a victim of the Sept. 11 attack on the Pentagon. 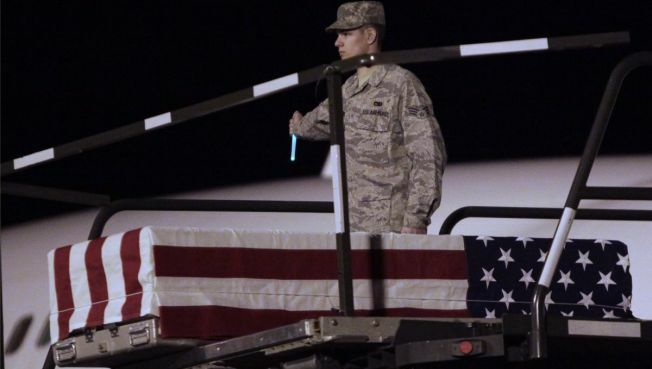 One objection to lifting the ban had been that if the media were present, some families might feel obligated to come to Dover for the brief, solemn ritual in which honor guards carry the caskets off a plane. Few families now choose to attend, in part because doing so means leaving home and the support system of friends at a difficult time. The sudden trip can also be expensive and logistically difficult to arrange.